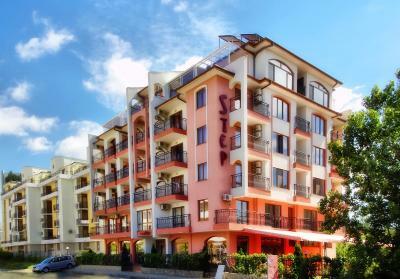 Lock in a great price for Step Hotel – rated 8.8 by recent guests! Location is great. 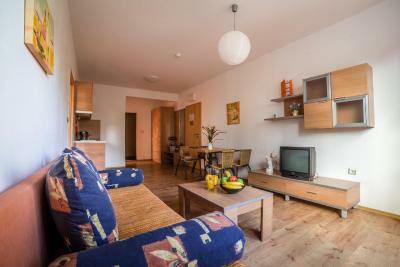 The room was very clean and the staff was very helpful. Hotel Step is like no other hotel. The staff is extremely friendly and responsive. 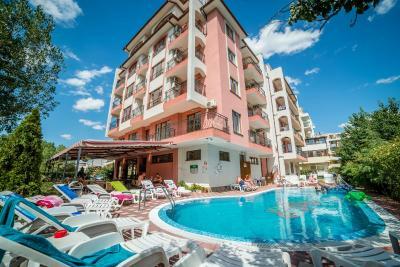 The hotel is very clean, good location, surrounded by restaurants, markets and facilities. Will visit again!!! 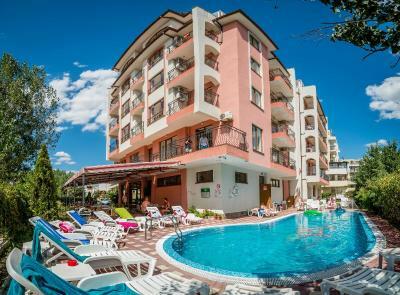 The hotel has a perfect location - a supermarket is just around the corner and the beach as well as the centre is like a 15-20 minute walk. 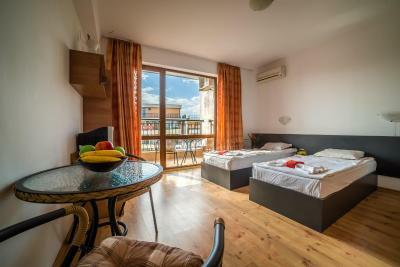 We booked an apartment for 4 people at Step’s which had two bedrooms, two bathrooms, an open kitchen and two little balconies. 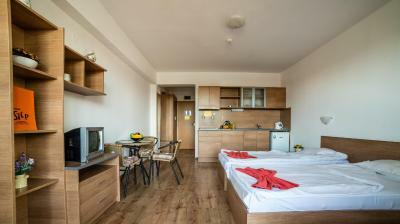 Our room get cleaned every day at noon and the staff helped us with every single issue or question we had during our stay. 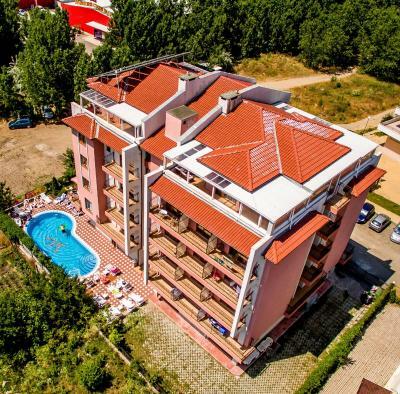 I’d definitely recommend this hotel if you‘re looking for a good place outside of the crazy nightlife at sunny beach (after partying we really enjoyed the silence and the good sleep we had at this place haha)! 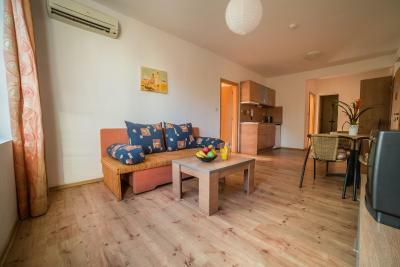 Quiet location, 10 minute walk to the centre. Staff were very friendly. Tip, if you need a taxi, book it at reception. Absolutely perfect location! 10 minute walk into town/the beach so it was quiet at night and the walk was very easy getting in. Right next to a monster supermarket that had everything you would need for your stay. Breakfast was basic, but well worth the few euros to save you the hassle of cooking in the mornings. 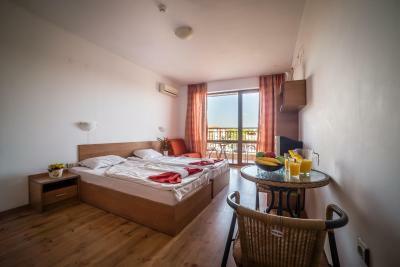 The rooms were clean upon arrival and the towels were changed two days into our stay. The bar by the pool had very good drink deals on daily too and the staff were always so lovely and smiling. 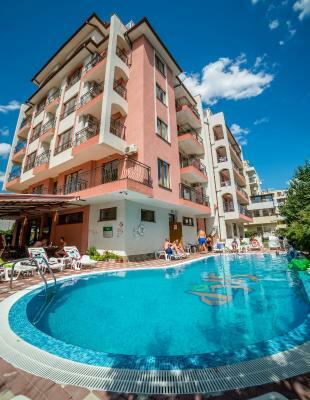 Would most definitely stay here if we were to return to Sunny Beach. The staff were great, especially Stefan. The food in the restaurant was great. Great value for money. 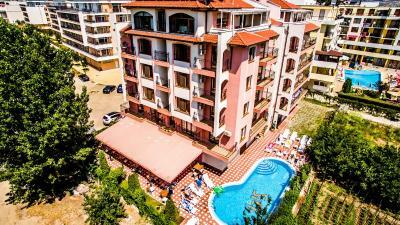 No problems what so ever with the hotel or the staff. Everything was absolutely spot on. Staff couldn't have been more courteous, friendly or helpful. Stafful profesionist, toți vorbesc engleza, mereu zâmbitori, se curata camera zilnic, așternuturi schimbate la doua zile, foarte ok.
Любезен персонал. Чисти стаи. Точно до хотела има безплатен обществен паркинг. Сравнително тих район. 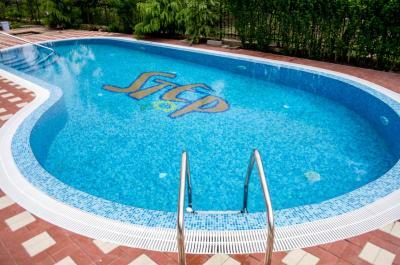 Step Hotel This rating is a reflection of how the property compares to the industry standard when it comes to price, facilities and services available. It's based on a self-evaluation by the property. Use this rating to help choose your stay! 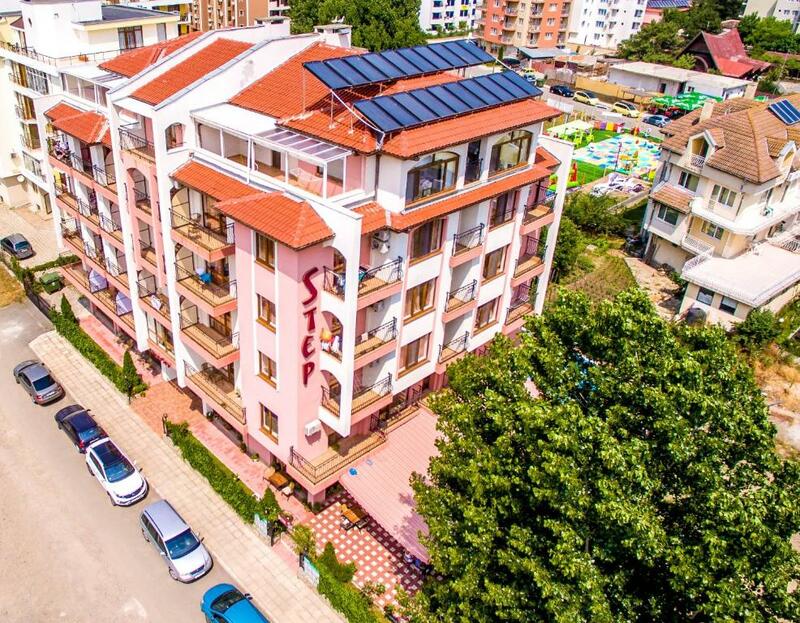 Conveniently located, a 5-minute walk from the center of the popular Sunny Beach resort and a 15-minute walk from the beach, the modern Hotel Step was built in 2007. 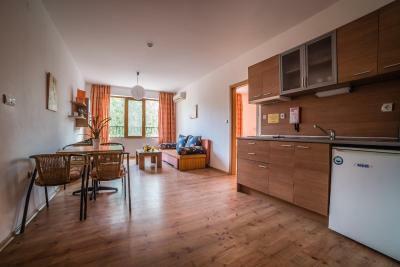 The 6-story building conveys a homely and pleasant atmosphere and is open from May until the end of September. 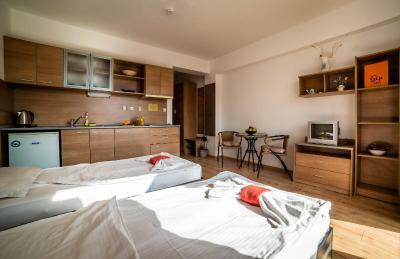 Hotel Step offers studios with the convenience of your own kitchen. Sample delicious meals and refreshing cocktails at the hotel restaurant on the ground floor. 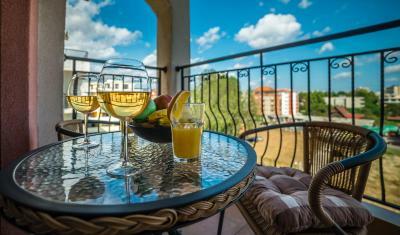 Wireless internet connection is available in the conference room, the bar and the restaurant. 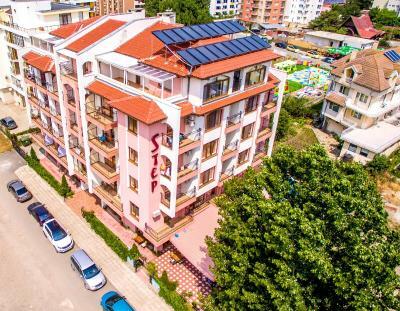 Hotel Step is just a short walk from the Sunny beach center but at the same time it is located away from the noise of nightlife. 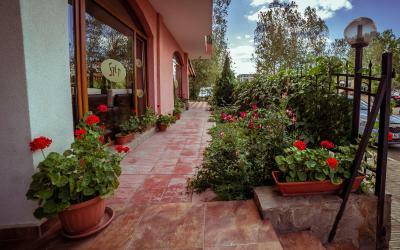 When would you like to stay at Step Hotel? 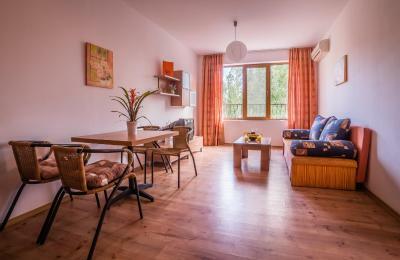 The studios are furnished in an elegant modern way, still managing to create a cozy atmosphere and to provide all the comfort you may need. 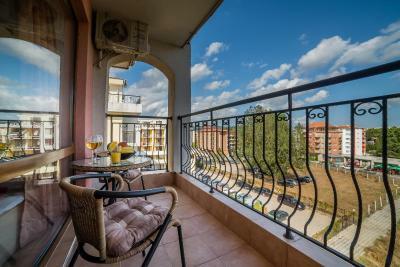 All of the studios feature a spacious balcony . 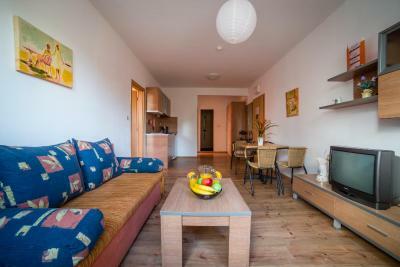 This apartment has a balcony, sofa and stovetop. 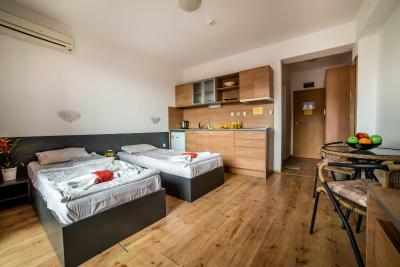 Please note that this apartment can accommodate 2 paid extra beds. The slogan of hotel Step is "Your home away from home" and this is exactly what we have been pursuing since we opened in 2007. 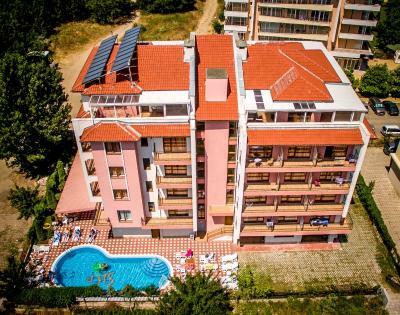 What makes us different from the other properties in Sunny beach is the amazing feel-like-home environment that we have managed to achieve through the years. We strive for outstanding customer service and for creating a cozy friendly atmosphere that will allow our guests to enjoy and relax as much as possible. 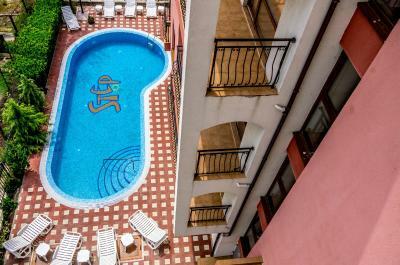 House Rules Step Hotel takes special requests – add in the next step! Step Hotel accepts these cards and reserves the right to temporarily hold an amount prior to arrival. There was nothing really that we didn't like within the hotel, just something which affected me personally. 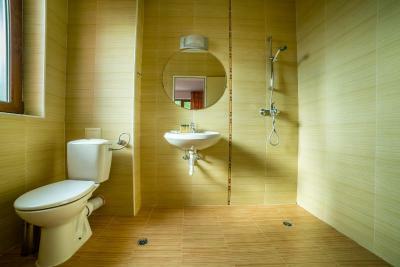 Because I have had a hip replacement I felt the bathroom floor wasn't very safe and was quite slippy when taking a shower. Therefore, to solve my problem we purchased some rubber ant-slip bathroom matting to put down whilst showering. That's all it took for me to feel safe. . Dried off easily to re-use again and again. Problem solved. Staff at the reception is somewhat unprofessional. Also, the maids would open my door at 9:45 in the morning while I was still in bed. They started cleaning around 9:30 smashing doors in the hall, why not start around 6 am? No shower curtain in the bathroom.